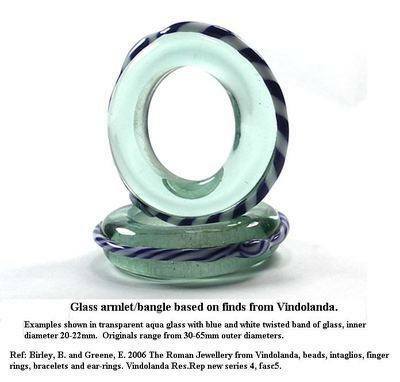 Based on finds from the Roman fort at Vindolanda, near Hadrian's Wall, this glass 'bangle' is made with transparent aqua glass, with a band of blue and white twisted cane applied around the circumference. No one is sure of the exact use for these items, but they appear in various diameters, ranging from around 30mm up to around 65mm. Each bangle is individually made and may vary slightly from the ones shown in the image, which shows two bangles to give an idea of shape and decoration. The price is for a single bangle. These smaller examples range from approximately 20-22mm ID.